While saying “I love you” expresses how you feel to your child, when you’re able to clearly communicate your love in a tangible way that your child understands, there’s no chance your child will miss the message. Considering your child’s interactive style when showing expressions of love helps assure that your child, without a doubt, feels love, cared for and connected. Many parents, especially those of multiples, recognize that each child has his or her way of learning about the world. During the toddler years, for example, a parent may recognize that one child has more success learning a new skill when he tackles it on his own, while another has more success when modeling the activity after mom or dad. This is because each child interacts with their world differently. In fact, there are four separate and distinct categories of interactive styles. These groups include achievers, thinkers, harmonizers and influencers. While there are bits and pieces of each interactive style in all of our children, children typically exhibit one or two dominant styles that direct how they interact with their world. For this reason, it should be no surprise that a child’s interactive style also influences how they feel and receive love. Once you understand what your child’s interactive style is, you clearly speak their love language, connect with them on a deeper level and tangibly demonstrate your love for them in a way they’ll understand and appreciate. Achievers tend to be children who have a great need for freedom and self-expression. These children shy away from talking about their problems and feelings, and instead love the challenge of trying something new and achieving a goal. Achievers tend to be independent and appreciate all that is concrete. They often don’t like to show or receive much affection. Parents of achievers can tangibly show their child by love by giving gifts, offering positive, purposeful praise and by acknowledging and recognizing their child’s achievements. Also don’t be afraid to challenge them to something new. They thrive on learning experientially. Thinkers tend to be children who thoroughly examine issues. These children tend to be non-competitive with others, but set high standards for themselves. They are great team members, and loved to be involved in family activities. Thinkers tend to be perfectionists and value relationships, intimacy and trust. Parents of thinkers can tangibly show their child love by spending time with their child, discussing issues of interest, read books and magazines together, demonstrating understanding and speaking lots of positive words of affirmation to their child. Harmonizers tend to be children who are the peacemakers of the family. These children tend to internalize their feelings and worry about those close to them. Harmonizers crave stability and value relationships. Parents of harmonizers can tangibly show their child love by setting up a weekly “date night” where they spend time doing something special together, by giving gifts, by demonstrating trust, and by modeling open and honest communication. Influencers tend to be children who are creative and artistic. These children tend to be dreamers and love being the center of attention. Influencers tend to be affectionate and like to be around others. Parents of influencers can tangibly show their child love by supporting and fostering their creative spirit, by sharing an interest in the arts, by doing something creative together, like an art project or writing a song, by showing lots of affection and by actively engaging their child in doing things of interest to him. All children have a deep desire to feel loved, accepted and liked by their parents. 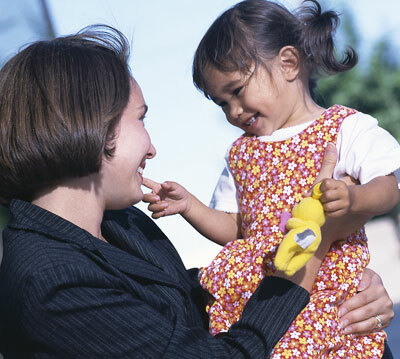 When children experience a warm and loving parental relationship, they have increased self-esteem and confidence. Children who feel good about themselves are less likely to seek out negative attention or to engage in risky social behaviors. Considering your child’s interactive style when showing expression of love can help assure that your child, without a doubt, feels loved, cared for and connected. available at your local bookstore or on Amazon.com. © 2010 by Dr. Caron Goode.